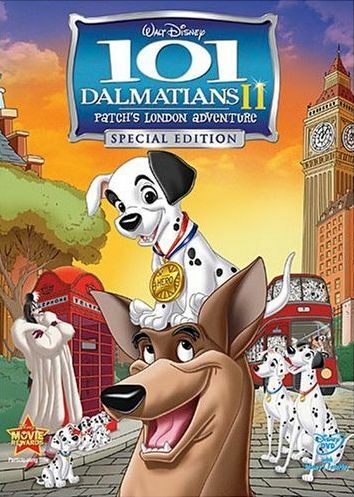 After watching 102 Dalmatians, the extremely disappointing sequel to the enjoyable live-action 101 Dalmatians feature, I was hesitant about starting in on 101 Dalmatians 2: Patch's London Adventure , sequel to the original animated Dalmatians film. Especially considering I've seen several straight-to-DVD releases from Disney, and none were that great. But I already had it at the house and figured I might as well check it out. Thankfully, it's not bad. Not bad at all. And unlike the live-action sequel, this one finds the return of all the major players from the first film, not just Cruella De Vil. The story picks up not too long after the end of the first film. Roger and Anita Dearly are living happily with all one hundred and one dalmatians, but their place is just too small to handle all the critters, so the entire family is packing up and moving to a plantation. Before moving day arrives, we see that one of the little tikes, a pup named Patch, feels lost within his big family. He feels left out, and completely not special. So when the family accidentally leaves him behind when they move, Patch takes the opportunity to go see his hero, Thunderbolt, star of a hit television show, who just happens to be making an appearance in London. Meanwhile, Patch reaches to Thunderbolt's appearance, where they're holding a barking contest to see who will get to appear in an upcoming episode of the show. Unfortunately, Patch's bark sounds much more like a little squeak toy. But it matters not, as Patch is just happy he got to meet his hero. When Thunderbolt is told by his ever faithful sidekick that he is going to be written out of the show, replaced by a younger dog, Thunderbolt decides to go out and do some real hero stuff to show that he still has the right stuff... problem is, he has no idea how to really be heroic. That's where Patch comes in. Patch knows every episode of the show backwards and forwards, so he's able to tell Thunderbolt which show stunt would be perfect for the real-life situations. Thus, the two partner up and seek out situations where Thunderbolt can be the hero. Unfortunately, all the situations where they think they're helping out are actually situations that were fine to start out with and made into some kind of disaster by their interference. Of course, they don't realize this, and think they're doing a great job, which makes the scenes all the more funny to watch. At any rate, I have to admit that I actually enjoyed this sequel. Unlike the live action sequel, this movie had a plot that was multi-layered (yet not complex or confusing) and characters that you could identify with and wanted to root for. It doesn't have the same emotional appeal as the original classic film, and there were a few repeated themes, but overall I'd say that this is a good follow-up. 101 Dalmatians 2: Patch's London Adventure , released by Walt Disney Video, is available starting September 16, 2008.